Football season is finally here...and everyone knows that game day just isn’t complete without the ultimate tailgating party! Whether it’s with a group of friends huddled outside the stadium or the family gathered around the TV in the den, tasty food and snacks are essential to a "winning" tailgating experience. Tailgating for most of us conjures images of greasy pizza and saucy wings. With a little vision and planning, you can score big by offering a menu that's just as delicious but a bit better for you. We know few people go to tailgate parties for the veggies – it’s definitely a time to indulge and enjoy. But it doesn’t have to be a total eating catastrophe. At Frito-Lay, our portion control sizes make it easy to enjoy all your favorite treats – in moderation. And simple "tricks" like offering dips made with reduced-fat sour cream or that offer positive nutrition like salsa or guacamole, cooking with lean turkey meat and fat-free refried beans can cut hundreds of calories off your meals and still taste great for you and your hungry fans. 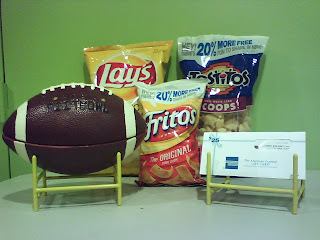 I'm looking for a new recipe to use at my Pittsburgh Steelers football parties using Frito-Lay products. It can be Frito-Lay Pie, Dip for Tostitos, etc. The person who submits the best recipe (judged on taste and better-for-you ingredients) will win the items in the photo above: better-for-you Frito-Lay products, a gift card for purchasing your ingredients and a stylish dish to serve your delicious recipes. Please leave a comment with your favorite recipe using Frito-Lay products. The giveaway will end on October 18th at midnight and will be emailed and announced here in a new post on October 19th. Awesome giveaway! When I was little we would get the little bags of fritos and put taco meat, lettuce, cheese, etc in the bags and then crunch it up and eat it with a fork from the bag and i loved it! Now I like to do it with chili cheese fritos or doritos in a bowl. Nice giveaway! It would help the tailgating! Grease casserole dish( 13" x 9") with reduced calorie spray.Put 1/2 the Fritos in the bottom of the pan. Then layer the chicken and the other half of the fritos. In a bowl mix both soups, milk, about 3/4 of the container sour cream, salsa and onion. Pour over the layers. Top with cheese. Bake 1 hour @300. Serve with sour cream on top. I then take fritos and crush them and add them to the bottom of the casserole dish as a crust. I then start layering the chili, sour cream, cheese, jalpenos, guacamole, black olives and then more crushed fritos. Of course you can use whatever toppings you like and even make more layers. It's really tasty and it can be served as is or with chips. Brown sausage in a frying pan and drain grease. Pour in a small container of fat free sour cream and add a can of Ro-tel, your choice of flavor. Heat and serve with a bowl of Tostitos and Fritos. I love having a backyard tailgating party!! I pick fresh ,organtic veggies and its always a hit!! Fast, easy and simple. Some people love it and I make it for xmas,jar it and they look foward to it. I have to make it every year!! 1 bag of Frito Lay Scoops. Brown turkey meat in skillet, add the Taco Bell seasoning packet follow directions on packet. Take a cookie sheet put the Frito Scoops on the sheet in rows. Put a teaspoon of the prepared taco meat in each scoops, sprinkle the top with the shredded cheese put into preheated oven for about 10-15 minutes until the cheese is melted. For addional toppings you can use sour cream or salsa. I like non-cooking game day recipe, so here it is. Healthy, delicious and low calories! Frito Pie (can you tell we live in Texas?) go cowboys! Recipe: meat chili over fritos. Yum. In a large bowl, combine the tomato, green pepper, cucumber, black olives, corn, and green onions. Pour the Catalina dressing over, and toss to coat. Stir in the cheese and corn chips just before serving. I brown 1/2 lb lean ground beef. Add 1 can sodium free tomatoes and 2 can of rinsed kidney beans. I add 1/2(I have a 10 year old sensitive to spicy so you can add more)a jalapeno and low sodium chili seasoning and continue to cook. I garnish with low fat cheese and fat free sour cream and we use this as a dip for fritos. Basically by reducing the meat and increasing the veggie as well as using low fat and no fat dairy you improve the nutritional value. Really good and less calories than the traditional Spinach Artichoke Dip. Ingredients - Tostitos, 1 lb. lean hamburger, 1 package of taco seasoning, 1/2 diced onion, 2 diced tomatoes, 1 cup shredded lettuce, 1 cup shredded cheese, Fritos Bean Dip, Tositos salsa. Layer plates with Tostito chips, seasoned hamburger, cheese, bean dip, onion, tomato and lettuce. Top with salsa. Layer in order.Serve with baked chips! !